Sense About Science is coordinating a mass posting of Simon Singh’s deleted Guardian article about chiropractic, which was the subject of bogus libel action by the egregious British Chiropractic Association. Satirist Sacha Baron Cohen has had to step up security because of threats received by a Palestinian terrorist organisation who he mocked in his latest film Brüno. We reserve the right to respond in the way we find suitable against this man. The movie was part of a conspiracy against the al-Aqsa Martyrs’ Brigades. That’s right al-Aqsa Martyrs’ Brigades, the whole film was just a set up to make you and you alone look stupid. The BBC Radio 4’s Now Show has allowed a blasphemous satirical tirade against the Lord Jesus and the Word of God. We urge you to complain to the BBC (click here) at the offence caused to Christians and the corrupting effect of this kind of behaviour on a vulnerable audience. Perhaps what gave the pious pearl-clutchers of CCFON the vapours was the likening of Almighty God to “a paranoid menopausal housewife with an adulterous husband”, owing to his using up the first 4 of ten commandments to bolster his own fragile ego. Anyway, you can hear the whole thing, suitably illustrated, on YouTube. Provided you aren’t vulnerable, that is. We wouldn’t want you to get corrupted. Oh, and why not take CCFON’s advice and write to the BBC. They deserve a bit of praise every now and again. UPDATE: (27 July) This is priceless. The CCFON’s next mailshot – sent out the day after the one containing the Brigstock complaint – is about the perils of the government’s Equal Treatment Directive. It is a dodgy bit of legislation to be sure, but CCFON’s objections to it are quite breathtaking in their hypocrisy. “Harassment,” as defined in the Directive however, allows an individual to accuse someone of discrimination merely for expressing something the individual allegedly perceives as offensive. The freedom to speak freely about one’s religious beliefs should not be considered “harassment”, but should remain a fundamental right in a democratic society. Adopting a provision covering harassment on the grounds of religion or belief or sexual orientation in the provision of goods, facilities and services creates a massive chilling effect on freedom of speech and the free exercise of conscience by religious people. One wonders if even their supporters take these clowns seriously. One day they are squealing about how offended they are, and the next they are pontificating about how taking offence shouldn’t interfere with the “fundamental right” of free speech. They really do seem to think that freedom of speech should only apply to them. The Freethinker has reported on a case in Malaysia which should have you all gasping with feigned shock. It seems part-time model Kartika Sari Dewi Shukarno, 32, found herself in a Sharia court after Islamic authorities raided a hotel nightclub in August 2008. She pleaded guilty to drinking a beer and was sentenced on Monday to suffer six lashes from a rattan cane and to pay a fine of 5,000 ringgit (around £850). The punishment “is aimed at making the accused repent and serves as a lesson to Muslims,” the New Straits Times quoted Judge Abdul Rahman Yunus as saying. 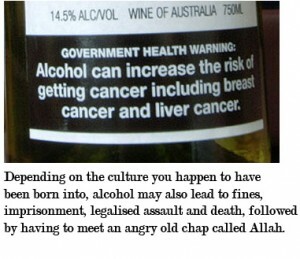 Consuming alcohol is a religious offense for Muslims. Muslims, who make up nearly two-thirds of the population of Malaysia, are forbidden from drinking alcohol although the sale of alcohol to non-Muslims is permitted. Most offenders are fined, but the law also provides for a three-year prison term and caning. Well, it’s official. While refusing to do your job in favour of protecting an ugly stump in the likeness of the Virgin Mary is still positively encouraged, remarking “Well if she looked like THAT, no wonder she’s a virgin” might actually now land you in prison. President Mary McAleese has this morning signed the Defamation Bill into law. The Defamation Bill updates Ireland’s defamation law, renewing the (formerly outdated) offence of blasphemous libel. The Irish Times describes the bill as “aim[ing] to encourage quicker apologies from publishers”. The extent of this ruling remains to be seen. 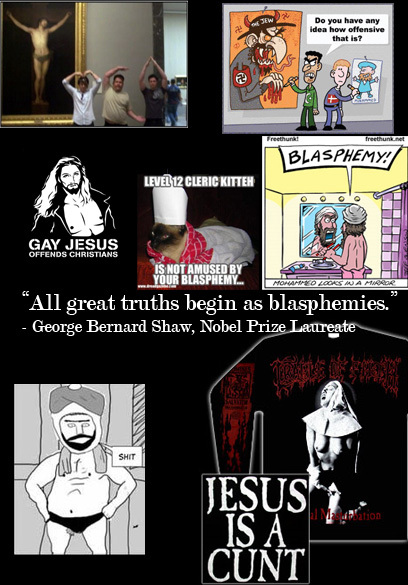 While the term ‘blasphemous libel’ suggests that publicly making a claim about Jesus which is later proven to be untrue could land you in trouble, it is unlikely we will see members of the church arrested for making exaggerated claims, such as the (potentially insulting) claim that Jesus died a virgin and later returned as a zombie – or simply that he was homophobic. However if any Irish readers get the chance to see if the law works both ways, I strongly endorse suing your local clergyman for blasphemous libel should they dare to utter such atrocities. Of course, it is far more likely that this law will be used to constrict free speech, particularly in the media. Once cases of prosecution start to occur as a result of this law we will be sure to report more on this issue. I would speculate more on this topic, but for fear of imprisonment (not to mention eternal damnation) the offensive tone of this post will stop here. Atheist Ireland has sent a letter to the President, Mary McAleese, on the day before she is due to decide whether or not to refer the blasphemy bill to the Council of State. – The law is contrary to the guarantees of equality under the law enshrined in Article 40.1 of the Irish Constitution, and of freedom of conscience and religion enshrined in Article 44.2. – The law is contrary to Article 44.2.3 of the Irish Constitution, which says that the State shall not impose any disabilities or make any discrimination on the ground of religious profession, belief or status. – The law shifts the burden of proof to the defendant in contravention of Article 38 of the Constitution, and of Schedule 1, Article 6, 2. and 3(a) of the European Convention on Human Rights Act, 2003. – The law does not meet the standard of prevention of imminent public disorder that made the old English blasphemy law compatible with the European Convention of Human Rights. – The definitions in the law are too vague to allow citizens to regulate their conduct, and it could make it unlawful for a religious citizen to inform his co-religionists about a statement he believes to be blasphemous. What with all this, plus the fact that it is a patently stupid law, can we afford to feel a little bit optimistic? UPDATE (22 July) Law lecturer Eoin O’Dell (of cearta.ie) has an article in The Irish Times which also challenges the blasphemy law on constitutional grounds. UPDATE: (23 July) Twitter says the president has just signed the bill into law! The Daily Mail’s Christopher Hart writes a scathing review of Lars Von Trier’s Antichrist. Not only does he admit to never having seen the film, but he thinks nobody else should be allowed to see it. The BBFC no longer ‘cuts bits out of films’ but provides information about films so that members of the public can make up their own minds about what films they want to see or avoid. Antichrist is presumably intended to shock. In fact, it doesn’t shock, it merely nauseates. sick, pretentious trash, fully confirming our jihadist enemies’ view of us as a society in the last stages of corruption and decay. The world of Antichrist, by contrast, is blatantly amoral, without any sense of justice or retribution whatever. Where does he get this almost supernatural ability to discern an unseen film’s quality? Maybe God talks to him. 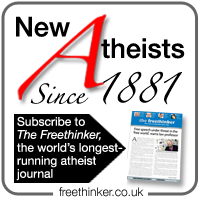 He did write a breathless review of The Genesis Enigma – a preposterous book which claims the Book of Genesis fortold the theory of evolution 3,000 years before Darwin. So he is obviously a cretin. How could anyone possibly judge a film that they had not seen?! People can make thier own choice as to weather they want to watch it or not. You pride yourself on being broad-minded? I think perhaps you need to be slightly less proud of yourself today. That was a classic piece of closed minded criticism, of a film you haven’t seen, giving it a context you don’t fully understand, and claiming a lack of morality which you couldn’t possibly know – because you haven’t watched the film! It was a hysterical read – and I mean that in the least complimentary way possible. “I haven’t seen it myself…” I stopped reading there. How can any person speaking in a public forum, especially a film critic possibly make judgement over any film that they have not seen. Your job is to give us the detail rather than spew your moralistic, religious based ideals. Religious ideals that have no more right to a truth save for the fact we are told it as truth, than the plot of this movie. Do your job and be professional and don’t bore us with your own personal afflictions. If you haven’t seen the film What gives you the right to comment on it??? You’re as bad as those hypocrits that banned The Life of Brian all those years ago! I’d have been prepared for your side of the story if you’d watched it but as you haven’t I’ll watch it myself and make up my own mind!! Irish Blasphemy law – a step back from the brink? The protests and the ridicule may be having an effect. President McAleese has decided to convene a meeting of the Council of State, under Article 26 of the Constitution, to be held at Áras an Uachtaráin on Wednesday 22nd July at 6:30pm, for the purpose of consulting with the Council regarding the Defamation Bill 2006 and the Criminal Justice (Amendment) Bill 2009. To put this in perspective, this will be only the 27th time a Council of State has been convened since the Constitution of Ireland came into force at the end of 1937. The last time was in 2007. Ireland may yet be saved from a return to the Dark Ages! This item has been removed from sale due to a legal reasons. “Legal reasons”? As far as we are aware, there are no legal reasons for Amazon.co.uk not to sell this book. If you know otherwise, please get in touch. The book is still available from Amazon.com. So, here we go — Catholicism is a cannibal cult which eats its leader, Jews who believe that God wants them to settle in the Holy Land are deranged lunatics, Muslims who want to install Islamic law are nothing but fascist terrorists and Scientologists are nothing but a bunch of brainwashed weirdos who have been suckered by the malicious rantings of a failed science-fiction writer. Alright lads, I’ll see you in court. Well, it’s more like defamation than blasphemy – apart from the Catholic clause it attacks believers rather than their beliefs – but it’s a start. Let’s hope that Atheist Ireland do a better job. They should be able to, provided they don’t get bogged down with concerns about dismaying “normal believers,” in which case they are doomed to fail.